Ladies, grab your Southern hats and frilly frocks and fellas, grab your seersucker suits because it’s time for the Kentucky Derby! The Derby takes place in Louisville on the first Saturday in May. The Derby is an exciting sporting event, but this celebration is so much more than a TWO minute horse race! The Derby allows men and women to channel their inner Southerner and embrace the fashion and food of this springtime tradition. If you aren’t able to attend the race in person, we wanted to provide some tips to host your own fabulous Kentucky Derby party. The key to an amazing Derby party is the attire, decor and menu. Send your guests a Derby themed invitation to join you on race day! Invitation Box has a nice selection or go paperless using Evite, Punchbowl and Paperless Post. Ladies can let their inner Southern belle shine through by wearing bright colors, floral patterns, and, most importantly, a BOLD hat. When it comes to Derby hats, the bigger, the better! Men can transform into dapper, Southern gentlemen through seersucker or linen suits. Men should pair a patterned shirt with a solid necktie/bowtie and vice versa. Use the same rule for pocket squares. Don’t forget to wear a straw boater hat. Check out Vineyard Vines’ Official Kentucky Derby Collection. Offer prizes for the best dressed man and woman. Use decorative pieces to bring the race track inside your home. 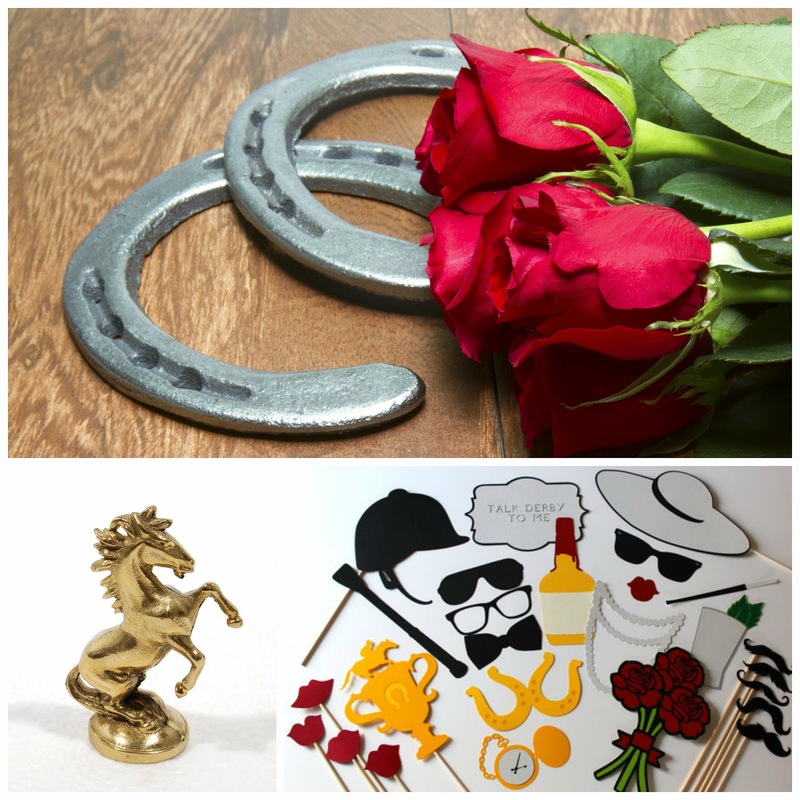 Incorporate horses, horseshoes, race trophies, black and white linens and large brimmed hats. Check eBay, Etsy, yard sales or thrift stores for horse figurines or bookends for inexpensive decor. The Derby’s nickname is the Run for the Roses, so add pops of color with red or pink roses. Roses and boxwood topiaries make great centerpieces too. We love photo booths- you can find adorable props by Paper and Pancakes on Etsy. Your menu should incorporate Southern fare. Replace the traditional cheese plate with a Derby cheese hat! Roasted butter pecans with rosemary, watercress canapés, curried egg salad in pitas and Paula Deen’s benedictine sandwiches make for delicious cold appetizers and mains. For hot apps and mains, we suggest Martha Stewart’s buttermilk biscuits, baby hot browns, and Paula Deen’s fried chicken. Hot food requires more attention during the party, so we recommend more cold / room temperature foods. For dessert, serve the Derby Pie- with chocolate, bourbon and pecans it’s guaranteed to be a crowd favorite. We suggest making the recipe into tartlets using Williams Sonoma’s tartlet pan. From our experience, mini desserts fare better than larger ones. If you prefer to make a pie, we recommend using William Sonoma’s Emile Henry Aristan Pie Dish. You can also add bourbon balls and sticky toffee pudding to your dessert table. We always use our KitchenAid Stand Mixer to make desserts. You can use a hand mixer or whisk, but it’s easier and faster to use the KitchenAid. Mint Juleps are the traditional beverage of the race. We recommend Danny Meyer’s Run for the Roses from his book, Mix Shake Stir. See the recipe below. Horse racing is more exciting when there’s something on the line! Your guests can bet on the Kentucky Derby at TwinSpires.com or you can set up your own pool. Just remember to provide your guests with current daily racing forms.